"This sauce is usually served with Finnish or Danish rice pudding. When I made this with Finnish rice pudding, my husband said I could forget the pudding, but begged that I keep making the raspberry currant sauce on a regular basis! 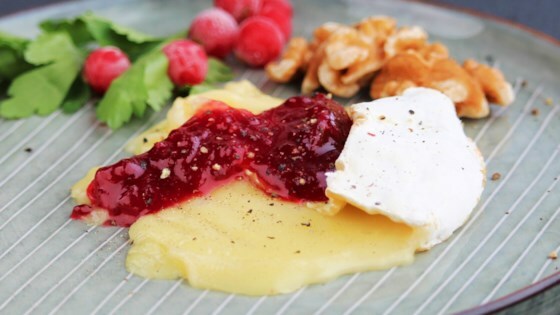 It can also be made with fresh raspberries or cranberries, fresh or frozen. Serve on vanilla ice cream, pound cake, or over fresh berries." Combine the raspberries and jelly in a saucepan over medium heat and bring to a boil. Mix the cold water and cornstarch; stir into the raspberry mixture. Bring to a boil, stirring constantly; boil and stir one minute. Cool. Press through a sieve to remove seeds. (Don't skip this step!) Chill before serving. Excellent for both sweet and savory dishes. I served it over grilled Camembert cheese. Thank you for the recipe. I really love the texture and vibrancy that it has, I have been very lucky to stumble upon this gem on all recipes.